Up until about 9 months ago, I had never imagined traveling to Jordan. It never even crossed my mind. But then, when we were still snuggled into our lives in Chicago and in the planning stages for this trip, we had an Uber driver who opened the door. While explaining how much he loved Chicago and taking his children to see the Christmas decorations downtown, we got to talking about his home. He was Jordanian and proud of his people and his culture. He entranced us with his descriptions of life there, passionate about the beauty of the land and the harmony of the diverse people. He also emphasized the stability of Jordan despite the conflicts in its bordering countries. We promised him we would look into it and that night we did. And now, less than a year later, I have seen a part of the world that I never thought I would see. I have walked ancient roads and stood next to buildings that are testaments to history itself. I have sat under the stars sharing tea and conversation with people who have had so many different experiences than me. And I keep thinking back to that Uber driver, wishing we had saved his contact information so I could thank him for planting that seed. Have you ever been to a desert? A real, monochromatic, hot-griddle sand, shifting dunes, bone-dry breeze desert? We hadn’t. Even before landing, it was a mental challenge to process what our eyes were taking in. The sand, the rocks, the houses, everything was a variation on the theme of beige. Coming from the lush tropics of southern Asia, it felt like an entirely different planet. I have to admit, I found myself regularly calculating chances of survival if dropped on the side of the road. The sum never came out very encouraging. This immediately put us in a position of needing to trust others. Physically, culturally, communicatively, we were reliant on others essentially our entire time in Jordan. For someone as doggedly independent and stubborn (though I still prefer the term diligent) as I am, this was both challenging and refreshing. We took this trip to learn, to stretch, to grow, and that’s exactly what Jordan was preparing to do for us. The desert must have heard our mumblings about it’s lack of color because it almost immediately clapped-back with what was honestly the most breath-taking sunset I’ve seen. I don’t understand the science behind why the sun looks different sizes in different conditions, but something about the desert magnified it to dominate the horizon: a massive glowing ember of an orb, emitting brilliant reds, oranges, pinks, and yellows, which were painted upon the sand and throughout the vast expanse of sky. And that was just our cab ride from the airport! When we arrived in the town outside Petra, Wadi Musa, we were greeted by our host and ally for the week, Maryam. We didn’t know it at the time, but she would quickly become a friend and would even grow to make us feel like family in such an unfamiliar place. She is originally from the Netherlands but has a complex heritage and has lived in Jordan for almost a decade now. Thus, she was a helpful bridge for us between western and middle eastern culture. She has also lived in the Bedouin village as well as the town and knows nearly everybody in the area so she has all the ins, tips and tricks which she generously gave us throughout our stay. 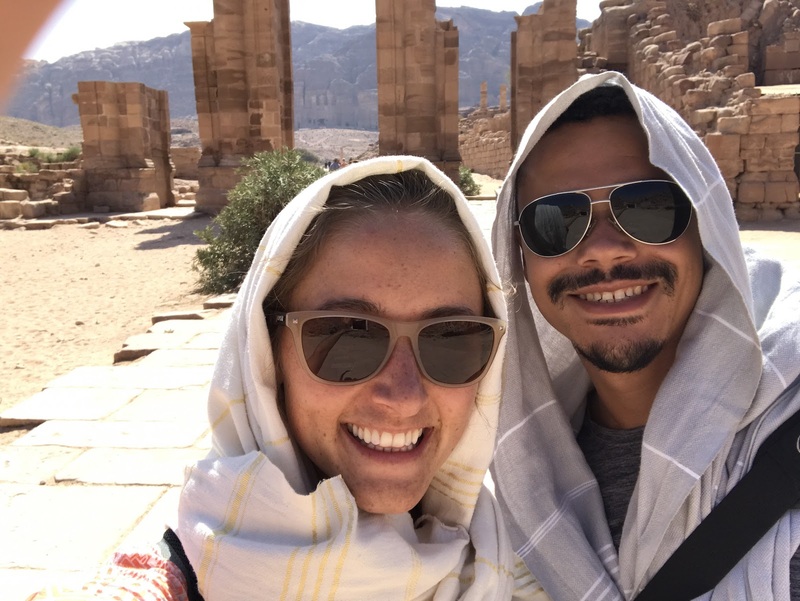 We spent the first day getting to know the town and resting up but then Maryam and Ashraf, her driver, took us to see the lesser-known Little Petra as an appetizer for the wonders we would experience in the coming days. We walked among ancient buildings and facades carved into the rock, explored old cave homes, and then hiked up through mountain crags, led at one point by a local Bedouin boy, to a viewpoint overlooking a roughly-hewn rock valley. The colors of the sand and rocks shifted between a coral pink, deep red, and sandy orange, but the most noticeable element was the silence. In so many of the places we’ve visited, I felt like the temples or shrines were charmed with a sacred hush, but here was a silence that was absolute. There are no birds chirping, no leaves rustling, no other feet crunching over the ground. The rocks must absorb whatever noise is there because the silence is so profound that you feel like your very breath is intruding on this landscape. After breathing in the quiet and allowing it to hush my ever-running mind, we made our way back to where Maryam and Ashraf were waiting with tea and shisha (hookah) to watch the sunset over the mountainside. We sat on the warm rocks and saw the towering mountains disappear into the night as the stars took their turn to shine. The next 2 days were spent exploring the endless treasures of Petra, an ancient city that is over 2000 years old. The people of Petra carved thousands of facades (building faces) into the cliffsides and then carved out caves for tombs, homes and other functions within them. Time and desert winds have worn away many facades, leaving segments of ornate design as teasers to your imagination of what this city must have looked like in its prime. Some buildings have been sheltered from history and still tower in the cliff faces, waiting to be discovered as you round the side of a boulder. The most famous of these is the Treasury, which I originally thought was all that Petra was. I couldn’t have been more wrong. The first day we walked 14 miles throughout the grounds, climbed the equivalent of 112 flights of stairs, drank 8 liters of water and only peed once (trying to get across the heat here, not our bladder strength). On our way through a particularly remote path, we came across a family of Bedouins who live in the nearby caves. They invited us to eat with them and we sat for a while sharing a home-cooked vegetable stew with pita. The children had fun practicing their English, which is eons better than our Arabic, and we continued on our way smiling though still sweating. ‍Obligatory picture of the Treasury, I like that there are people close to it so you can get a sense of how enormous it is! The second day we hiked up to a building called the monastery, the biggest one in Petra, and out to Bedoin tents overlooking the springs in the valleys. Here we ran into a girl from Germany named Lale who we had sat with for a little while the day before. We hiked with her for a bit before parting ways. Even though we took it easier on day 2, we still managed to walk 10 more miles. Ready to get off our feet, we took horses back to the entrance and Kolt did great on his first horseback ride. We spent a day touring the nearby desert valley called Wadi Rum. To our surprise and delight, Lale was sitting in the front seat when we got to our car and we set out laughing at another day together. Our guide, Mohammed, was friendly and hilarious; seriously, Jordanians as a whole have got some jokes! He took us to ancient carvings, mysterious rock formations, and towering sand dunes. He did a few heart-stopping off-roading maneuvers in his Jeep which gave us time to scream and giggle. The night before we left, Maryam’s upstairs neighbor invited us all up for juice and conversation on the rooftop. We sat with them laughing and chatting under the stars, hearing their everyday gossip as well as their concerns for their country and the world at large. The next day we set off on an all-day tour up the western side of the country, stopping to see Shobak castle from the time of the crusades. We got to swim in the Dead Sea, which is a story unto itself (see The Joy and the Peril of the Dead Sea) and even got to visit the top of Mount Nebo, a site that is meaningful to Islam, Christianity, and Judaism. There is a Christian church at the summit with remnants from the 500s AD which was a surprisingly emotional experience for us. Having seen so many places of worship for other world religions and watching the devoted come to pray or offer gifts, it was so special to enter an ancient space that was created for us to worship in. We sat together in reverence for a while, praying and being grateful for the strange familiarity of such a site that is more than a millennium older than our country. Our time in Jordan was a series of contradictions. We were surrounded by heat and sand, seemingly best suited for death, and yet everywhere we looked was bubbling with life. The culture was often uncomfortable, but throughout our stay we were genuinely welcomed and guided. It was the most foreign place we have been and somehow we felt like we were coming home each day to friends. I am so thankful that we traveled outside our comfort zone and chose to trust the people around us so we could fully experience such an amazing place.